Collection boxes and box top information sheets are now set up in LS and MS next to the fundraising displays! PLEASE begin collecting box tops and dropping them in the collection boxes. 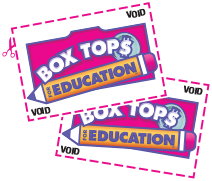 Box tops earn free money for ESK! Pick up an information sheet to find out which products have box tops for education and how much money we can earn! Next Box Top Submission: November 7th!